Looks like an open <b> tag went between reviews, making everything after the first review bold. It doesn't do this in v1, so it seems like it is relevant to v2. Seems fine now. Somebody must've already edited it. Could we create a warning system telling users that a band is already in the queue after this message? I submitted a band named "Novus Ordo" and some user submitted his draft, unaware of my submission. He probably missed this message when filling in all the band fields. Yeah, that's a known issue. As with all bookmarklets, just drag them into your bookmarks bar, and click them on the relevant page. This should save some time with adding large releases; and yes, it copies across the track lengths too (if available). Webmasters, could you please add the length for band names? This band has such a long name that in order to write it complete, one has to omit some spaces, which results in a very weird form. 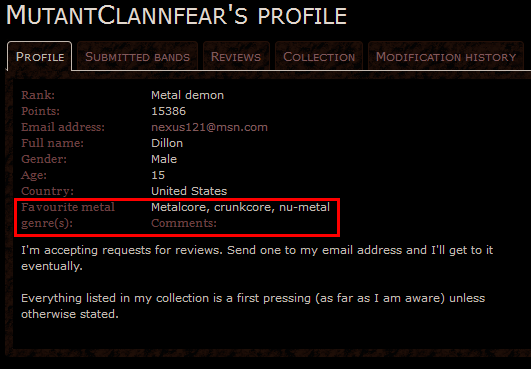 I reported it and was told that it was because the restraint of the maximum length for a band name. I've asked HellBlazer to increase it yesterday, it should get done soon. Is the website's layout "wider" or am I just crazy?! Nope, it was increased in width earlier today. Fits a lot more content this way. Phew! I was beginning to think that my sleep deprivation was making me see things. At first sight it seems that it could improve the reading a bit on the reviews as it stretches the paragraphs more but I'll have to get back on that matter later. One thing that sticks out on the "home" is that the MA logo now seems a bit out of place as it is aligned to the left. Maybe it would be better centred? Just a thought. Maybe it would be better centred? Just a thought. Erh, not a chance, mate. Centring the element would be a major inconsistency in the design - users would start to get a bit disconcerted by the sudden loss of balance. Trust me, you think you wouldn't notice anything now, but after browsing the site with the logo glaring at you in the centre of the page... it'd start throwing you off. The existing placement's perfectly fine. Think of the juncture between the logo and control panel as one of those square metal braces that you often see ornamenting the corners of an old leather-bound encyclopaedia. I was actually thinking about it being centred in the announcement's frame, it would be aligned between the number of bands and Encyclopaedia in that "There are currently 86583 bands, 222295 registered users and 68801 reviews in Encyclopaedia Metallum. ", so that you can see what I'm talking about. It doesn't bother me much and if it goes against the natural order of things I'll just need to grow accustomed to it. I have a thing (call it a paranoia, eh) with symmetries. I just noticed on my profile that "Favorite metal genre(s)" and "comments" are kinda on the same line, which can be kinda confusing. Edit: Did the font text change slightly, or am I just seeing things? Just curious. Last edited by oogboog on Sun Sep 23, 2012 10:41 am, edited 1 time in total. I just noticed on my profile that "Favorite metal genre(s)"
I don't see a line for "Favorite metal genre(s)"... there is one for "Favourite metal genre(s)", however. Opening a report ticket for it now. It's the same font, just a wee bit bigger. What are you guys talking about? I checked in three browsers and it looks perfectly normal to me...? Slightly bigger font for the band/album/artist/etc. data at the top of pages, and slightly brighter overall. This is with some recent version of Firefox, not exactly sure which. Ah. It's fine in Firefox here, but I see the issue in Chrome now (needed to ctrl+F5 twice, WTF?). I heard about that with Chrome a while ago, seems to be some issue with how it handles CSS. Here's a bit of info on it if you're curious. "Reminder: The status of the band is unknown. DO NOT change it to "split-up" unless it is officially confirmed." but according to the band notes: "According to Alexi, Sinergy has disbanded, and is no longer an active music project"
This is not a software issue... this is something that might warrant a report on the band page. Going back a bit to my earlier statement, the new layout does make reading a bit easier on the eyes. If you go to "My Reports" section, you see that by default the oldest reports appears first, and in order to see your most recent report, one has to scroll down or click "Date" tab. I think it's better to list the most recent reports first and older one later. Although it just saves one click, but still better. Well, one click may be nothing, but I think it's better that the older reports show first, because they are the ones that haven't been resolved/closed yet, so that more attention gets brought to them. Otherwise, those reports may just get buried and accumulate overtime. No wants to see a bazillion reports pending again. There are four tabs in My Reports. For Unassigned or Assigned, older one should appear earlier. But for Resolved and Closed, recent ones should appear earlier. Opinions? Seems unnecessary to me. There is practically zero effort required to click the button that takes you to the last page of closed/resolved reports. Artist index is down again. Grrr, and it had been so quiet lately too... Restarted. Can you check again? It, well, went down. Again.